Taking good care of your bicycle will help keep it working for years. A cyclist’s bike is one of their greatest possessions. Some people own one for a means of transportation; others use it for exercise and recreation or even for sports or competition. To own a bike means to take care of it, and make sure that it does not get damaged or deteriorate. A bike that is well-maintained and taken care of will not let you down. Riding a well-maintained bike is a joy to ride, even when you are traversing rough terrain. However, if you neglect your bike, problems may arise that canresultin damage. The first and easiest thing you can do for your bike is to make sure that you clean it regularly. You can wash your bike by sponging or scrubbing it using water and dishwashing liquid. Use a brush to clean the cogs, clean the chain with a brush and then apply a degreaser. Cleaning bicycle tyres isalso important. Remove your tyres and inspect them for signs of wear or tear. Wipe them with a cloth and remove debris such assmall pebbles, grass, or mud. Use a dampened cloth with household or dishwashing cleaner and wipe the different parts of the tyre. 2. Make sure your tyres are properly inflated. There aredifferent types of bicycle tyres and each kind requires a certain amount of air. The amount of air you must put in is usually on the side of your tyre. Checking your tyres regularly, especially every time you ride your bike, is a must. If you do not pump your tyres properly, they may get punctured easily. Use a pump that is compatible with the valve type of your tyre. The brakes of your bike are important for your safety. You must make it a point to inspect your brakes every time you use your bike. First, check the brake pads and ensurethey are not worn out. Check the cables by making sure you can squeeze the brake handles properly. Make sure that the clamp of the brake handle is not loose. Tighten the barrel of the brake lever to adjust. Clean the brakes regularly to avoid squeaks. Check the brake pads and if they are worn, replace them with new ones. 5. Check the tyres and wheel bearings. Well-maintained wheel bearings are important for a smooth ride. Use a bike stand or if you do not have any, take your bike off the ground using make shift stands. Check if the wheels are spinning smoothly. See if the tyres move in a gritty or coarse manner. Check if your tyres require truing or straightening. This procedure must only be done by bike specialists. The best way to take care of your bike is to clean and inspect it as often as you can. A regular, thorough inspection will help you identify problems at their onset, hence, preventing further damage and safety hazards. 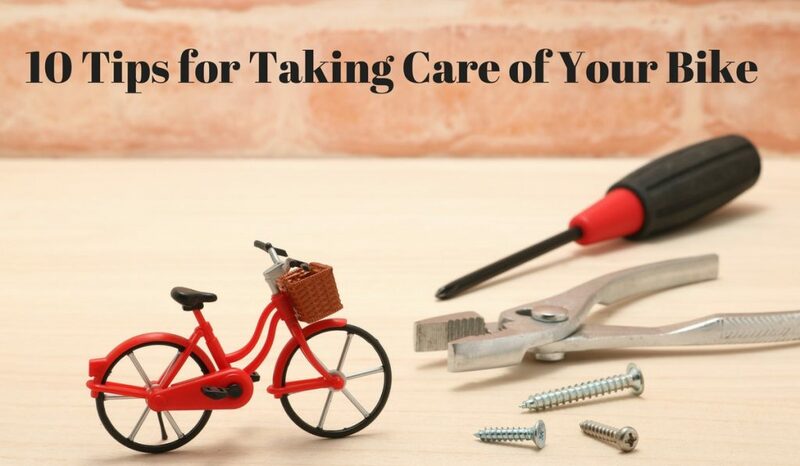 Aside from the maintenance that you can do at home, it will also help if you take your bikes to a bike repair shop for inspection from time to time. Also, buy only the best bikes and bike parts from a reputable bike shop.